Carmel Lewis Tulip Vase height 8 7/8"
Born in 1947, Carmel Lewis is the youngest of the legendary Lucy Lewis' three pottery-making daughters. Like her older sisters Emma and Dolores, she learned the art from her mother. 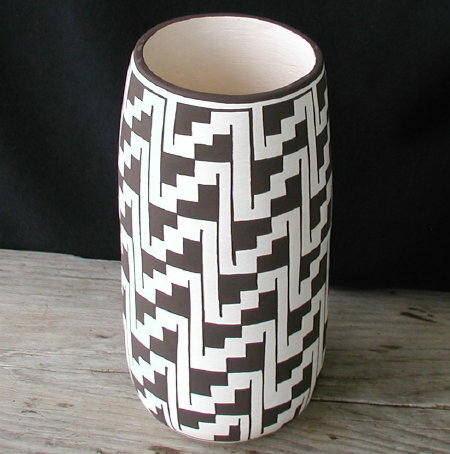 Carmel uses traditional designs only, including animals and oftentimes purely geometric designs of Anasazi or Mimbres origin. A photograph of Carmel Lewis and examples of her work are shown on page 145 of Dr. Gregory Schaaf's book Southern Pueblo Pottery: 2,000 Artist Biographies (she is listed in the book under her married name, Carmel Lewis Haskaya). This tulip vase proved difficult to photograph. The white slip on it has a certain luminescence which frustrates the camera; too much light and it literally glows, which tends to blur the clear lines of the painting, too much shadow and the wild spinach natural paint can appear black, rather than its true dark brown. This was photographed outdoors to show true color. Though the tulip vase is originally a European/ American art pottery shape, it was commonly used in Hopi pottery of the twenties and thirties and pops up in the work from other pueblos. This piece is an excellent fusion in terms of the shape of the vessel and its geometric decoration. Height: 8 7/8" Largest diameter: 4 1/4"
Opening: 3 1/4" Girth in center: 13 13/16"
*Note on shipping: All pottery shipped to foreign destinations is subject to additional charge for shipping and insurance to the destination. S & H calculated by the website for pottery purchases only applies to delivery in the U.S. Foreign buyers please inquire about shipping costs for specific pieces before purchasing.